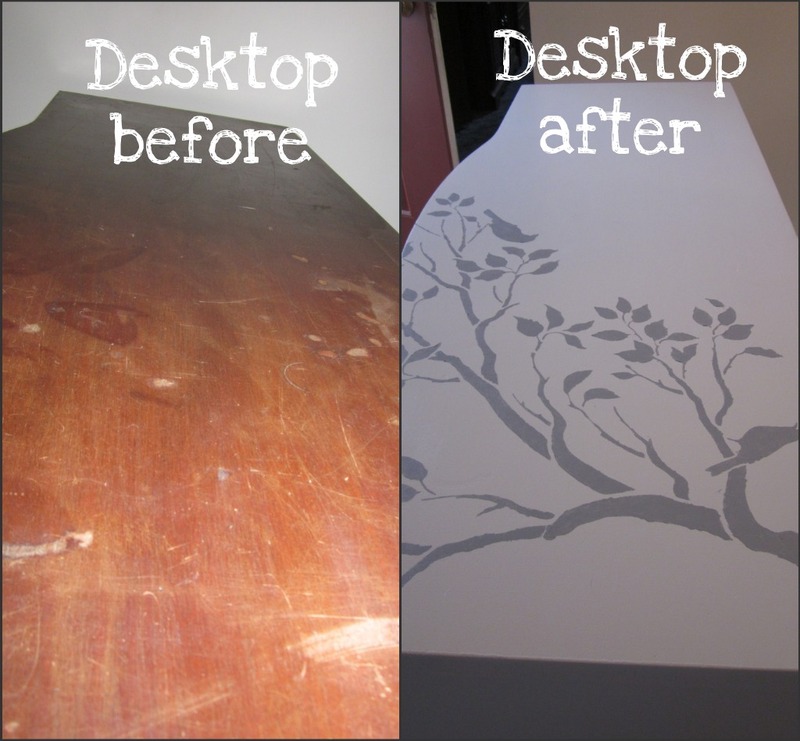 This stenciled desk went from a piece of trash to a true treasure. Proof that you don’t have to spend a lot of money to make a space that you love! I can’t tell you how excited I am to share this with you. This has been a LONG project, and one of my most exciting projects EVER! Back in September, I got this desk for FREE. Yes, free. FreeCycle is very good to me. You HAVE to check out your local chapter online! I got it from a lady who said it was from her niece’s second divorce. OK. Well, it found a forever home at my house. I was so excited in the beginning, and we took the hardware off, sanded, and primed the drawers. And then, it sat. For months. Until Christmas break, when I finally bit the bullet and finished this pretty lady! Dang it. I swear it is gray. You just really can’t tell…it is SO close to white! My original idea was to paint the desk a light muted gray, and then to stencil in white on top. Well, that couldn’t happen with this color. SO, I went to plan B. I figured I could reverse the colors, even though I wasn’t too excited about it. But I just poured some paint in a bowl, and mixed some leftover black paint in with it until I got the right gray color. I usually use Oil Rubbed Bronze for metals & hardware, but it was a little too “heavy” for this girly desk. I absolutely love this color! I am now converted! I am in love. And what’s even better? I only had to pay for the spray paint! Because I won the stencil, and I used a birthday giftcard for the paint, I only ended up paying $2.97 for this entire thing. So not only is she beautiful, but the price makes me a million times happier! Previous Post: « Welcome to my CLASSROOM! Beautiful! Love the finished result. I also won a Cutting Edge stencil and have been waiting for it to arrive! Can't wait to play with it. Beautiful! You did a great job on it! It is perfect. What a great job on that desk! You are an inspiration. I have an old wagon that I would like to redo as a coffee table any suggestions? That looks so good! Great job! Your desk is beautiful! I have a similar before desk that I picked up at Goodwill before Christmas. Yours is very inspiring, love the stencil. Amazing! And I love all the posts below too! By the way…I kept forgetting to ask you if you have ever heard of http://www.shanty2chic.blogspot.com They have great stuff too! You will probably love it! Wow, it's beautiful! Great work on it. This is stunning!! What a work of art!!! Thanks for sharing!! Christina… this is fabulous! What a beautiful makeover! Thanks so much for linking up! It's so pretty! I love how clean it looks. Stencils scare me, so you've inpsired me to give it a shot the next time I get an opportunity! I have to confess, I have tried so many of the crafts you've posted about and loved the way they turned out. I have been behind on blogging but when I catch up be prepared, tons are going to be linked to your site! Thanks so much for providing inspiration! that looks beautiful!!! i love the branches and birds, and the colors! i will be hosting a furniture makeover party starting tues night and would love for you to join! Love the new look, very beautiful! What a gorgeous piece. I love the soft colors and the stencil is fabulous. I just finished a very similar piece in red. Its fun to see how many different ways you can make a piece look with paint! Looks fabulous. Great colors and it goes well in the room. Wow, I love it! The stencil is a wonderful idea! Great job. Wow, that looks great! That desk has such a nice shape. Your stencil turned out reallllly good. P.S. I hate priming, too. I wish I could skip that step!! I was on searching for something to do to my kitchen table top and I think I found it. Thanks for the inspiration. Ooooh girl…that is one cute desk! Love the stencil! I hope you never, ever sell that! It's perfect!! So inspiring! Oh my gosh… I am in desk love! You did a fabulous job! I would buy that desk in a heartbeat! Thanks for the inspiration! Great job! When I first saw the title of the post before I saw any pictures I wondered if the stenciling would look out of date. The way you positioned it on both sides made it look very up-to-date and modern. Love color choices, too. HOW FANTASTIC!! Well done for getting a round to finishing it! definitely worth waiting for! and I can't believe how cheap it all was! Thanks so much for linking to A Round Tuit. Hope you have a wonderful week! What a fabulous job! I love your choice of colors, the placement of your art and the hardware. It turned out just darling! Would love to have you link it up to Passion for Paint this weekend! You should enter this in our party that starts tomorrow. Krylon is one of our sponsors. So so so so beauteous! Your blog just keeps getting better. Happy 2011! LOVE this! That stencil makes it look so pretty! I'm glad you kept the hardware. It looks just perfect repainted. I adore this-the stencil is so perfect, feminine and delicate for the sturdy desk-the hardware is the finishing touch-I'm your newest follower! Wow, what a difference. The stencil really makes it awesome. The hardware color too was spot on, kinda coordinates with the stencil. NIce! That stencil is so cute on your girly dresser! So great! Cutting Edge Stencils are great! You should link this up at the monthly contest over at thediyclub.com! This is gorgeous! Perfect color for the heardware! Thanks for linking to my party. Keep those super projects comin'! My daughter told me about your blogsite yesterday, and I've just check it now. She was telling me that she wanted your stencil desk design idea, but for her walls. We're planning to make a little make over for her room this month, then she finally made her decision for her room's theme, which is stencil art. Some of her stuff we're thrown, except for her cabinets, bed, and carpet. A cleaner that we hired do carpet cleaning (Addison-based). Thankfully he did a good job for carpet cleaning (Addison IL). Thanks for sharing you stencil design idea. It really help us to make a plan for my daughter's room. Found you via the Just A Girl link party! 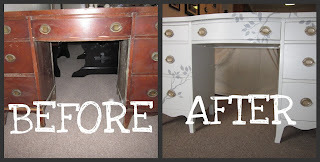 This is one of the best furniture transformations I've seen. Seriously. I saw the thumbnail and said, "Shut the front door!" out loud to myself in my cubicle. Awesome work! Looks great! Glad you liked the stencils you won! I love how it turned out and you can't beat FREE! I think I need to get busy stenciling something. Thanks for the inspiration! Really very pretty. Thanks for sharing. I actually have a desk in my garage that is STILL WAITING to be repainted for my daughter's room. I may have to try using a stencil on it. Thanks again. Stunning! I love the desk and the stencil. Doesn't it make you giddy to get something for free?! You really transformed the piece. Love the stencil! WOWEE! This is so gorgeous. We have a free desk, too, and I think I just might use this idea very similarly with ours. What an inspiration! This is so awesome!!! My grandfather had a desk like this one and I so wish that I could have gotten it, now looking at what you did. I love the stencil work. I am new to your site, but will be back often. beautiful! I love pretty re-do's and this one is awesome! Gorgeous job. Your efforts weren't wasted. Definitely something to be proud of. Well done! oh my gosh, I LOVE this! The colors are perfect and the stencil is beautiful! Great job, Christina! This turned out beautiful! I LOVE the stencil detail! How awesome that you got it for free?! Ohhhh this piece is so beautiful! Great job!! This is gorgeous – wow, I love it! That is beautiful! You did a fantastic job on it! I have a very similar desk (to the original here) that I use for scrapbooking. I'd love to do something with it now that I've seen yours … but I know I won't find the time. However, maybe someday… your desk definitely inspires me. Love it! You did a fantastic job! This is my first time visiting your blog, but I will be back! that is truely amazing! such a good job you should be proud! That is AMAZING! I'm going RIGHT NOW to find my local freecycle! This is soooo pretty! I am going to be doing my desk this month…thanks for the inspiration! I may just try to do something similar. I saw you on Better After. This desk is absolutely gorgeous. You did a great job. I give it a 10! Very, very, very pretty! The stencil truly makes it a show-stopping piece! This is one of the best afters I've seen. Your desk is beyond beautiful!!! Great job! Christina, your desk turned out beautiful! I love the stencil design. So glad I came across your blog. I'm a new follower. So pretty! I have that same stencil and I love it! It is just beautiful the way it wraps around the desk. Awesome job. My a.d.d. can't handle any kind of stenciling! you go girl! And I likey the caramel latte. I'll have to try that soon. I love it! It's so gorgeous and the colors are perfect. LOVE LOVE LOVE it! Just stopping by from the paint party!! I just love how this turned out! Isn't it amazing what you can do with paint and hard work? Great job! What a gorgeous transformation! I'm putting your desk in the Spotlight at The Power of Paint Party (PoPP). Thanks for linking up. Holy cow – what an awesome transformation! You did a fantastic job, it's gorgeous! I love the old pulls–so glad you kept them. Congrats on making the TOP 10 Post and be sure to check out EXCITING CHANGES at THE DIY CLUB post as well–REALLY EXCITING!! My sister and I would love to feature your desk on our blog this week! I would like to include a picture with a link to this post in the feature post, as well as on our sidebar for the week! Just let us know! absolutely adore this! Go freecycle!!! I love this desk so much I featured it as one of the inspiration desks for my future office! You did an amazing job. I love the stencil work. Love this desk! Thank you for sharing the source of the stencil and the brand/color of spray paint. Somehow I missed this makeover. Found it over at the CSI project. Very cool Freecycle find! Love all the details! wow, amazing! Fantastic job!! Love it!!!! So cute. Found you at CSI!